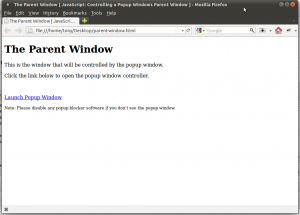 You may find it useful to control a parent window from a generated popup window, such as being able to manipulate its look, content, etc. One example being a web application I wrote for work. In the portion for entering a new sales order, products are added from a popup search window. When the product being added is selected, a button is clicked and the parent window’s line item table is modified to include the selected product. This is only one example as many others exist. 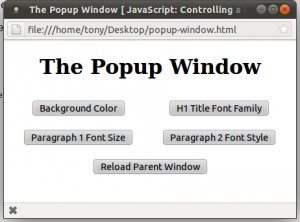 This tutorial will discuss how to launch a popup window and change properties of the parent (colors, fonts, sizes, and styles).